The Andes Mountains form the longest continental mountain range in the world, stretching some 4,300 miles (7,000 km) from north to south along the western edge of South America. The range runs all the way from Venezuela down to southern Chile and Argentina, with about 1,100 miles contained within Peru. Mount Aconcagua in Argentina is the southern hemisphere’s highest mountain, and the highest mountain in the world outside Asia. It rises up in the Mendoza Province, to a height of 22,837 feet (6,960.8 m) above sea level. 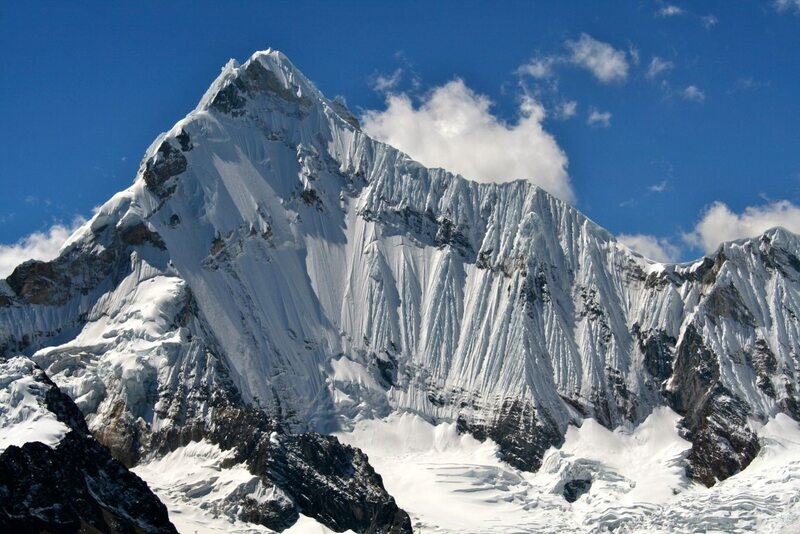 The highest mountain in Peru has two towering peaks. The highest, Huascarán Sur (the southernmost peak), rises up to 22,132 feet (6,746 m). This is the highest point in Peru and one of the highest in the southern hemisphere (705 feet below Aconcagua). The peak of its second summit, Huascarán Norte, reaches 6,655 m, which is still higher than Peru’s second highest mountain. Both are located in Huascarán National Park in the Cordillera Blanca mountain range, Yungay province, Ancash. The first successful ascent of Huascarán Sur was by the German-Austrian expedition of Bernard, Borchers, Hein, Hörlin and Schneider in 1932. Modern climbers normally start the ascent through Huaraz, which is the climbing and trekking hub (and capital) of the Ancash department. From there, they head to the village of Musho to the west of Huascarán before climbing the mountain. Nevado Yerupajá is also in the Ancash department, but forms part of the Cordillera Huayhuash range rather than the Cordillera Blanca. Its summit rises to 21,709 feet (6,617 m), making it the second highest mountain in Peru. The first successful ascent of Yerupajá was in 1950, when Jim Maxwell and Dave Harrah conquered this notoriously difficult mountain. Even today, with modern equipment, successful ascents are rare. Yerupajá’s ominous nickname — El Carnicero (“The Butcher”) – refers to the mountain’s knife-edge summit ridge with its serrated appearance. 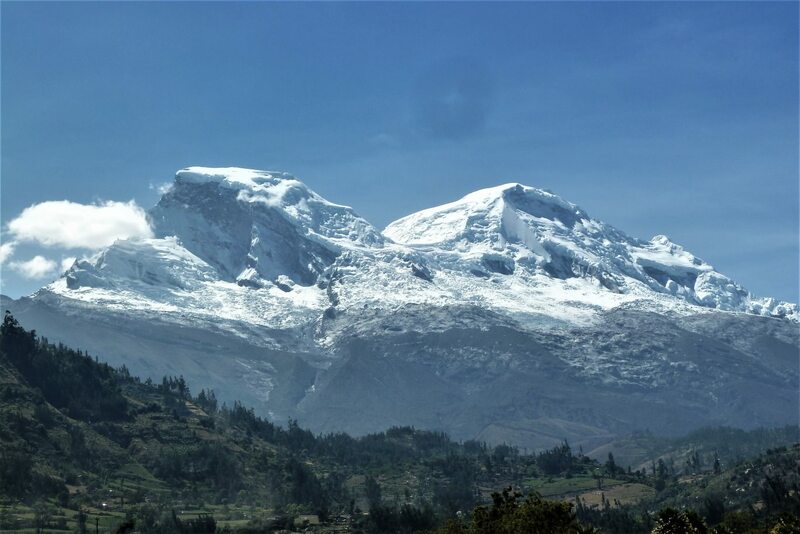 Most climbers approach Yerupajá first through Huaraz and then via the small town of Chiquián. 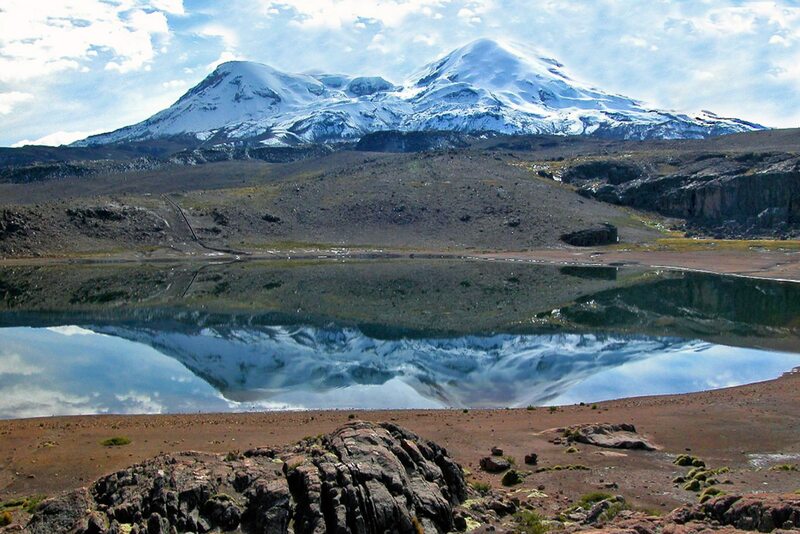 Coropuna is the highest volcano in Peru, and, at 21,079 feet (6,425 m), the third highest mountain. It’s located in Southern Peru, about 90 miles northwest of Arequipa. It actually has six summit cones of varying heights. Scattered across the vast mountain are the ruins of various Inca trails and temples, the best preserved located around the base and lower slopes of the mountain. The Incas worshipped Coropuna as a mountain apu, or spirit, and many locals still revere the volcano. Inca artifacts have been found high up the mountain, and they probably reached its highest summit. The first modern-day ascent was by Hiram Bingham and his Yale expedition in 1911 (the same year he rediscovered Machu Picchu, which makes for a pretty successful year, as years go). 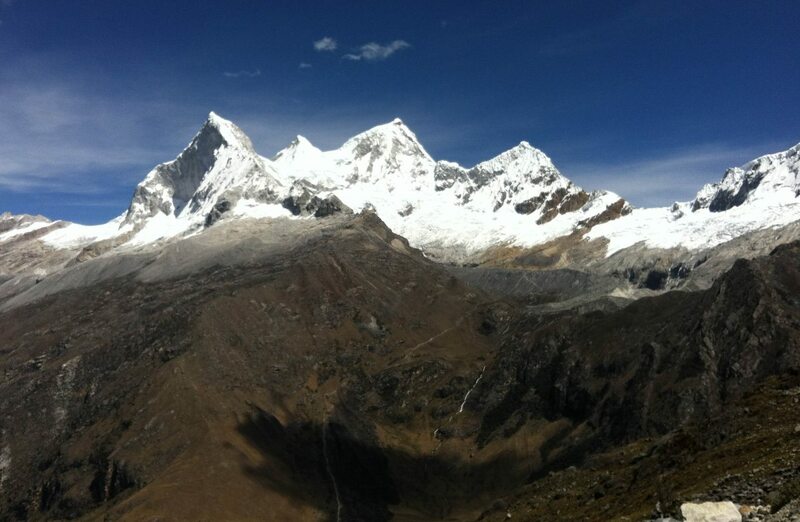 Another towering peak in the Cordillera Blanca, Huandoy isn’t all that far from Huascarán. It has four peaks, each one rising more than 19,685 feet (6,000 m). 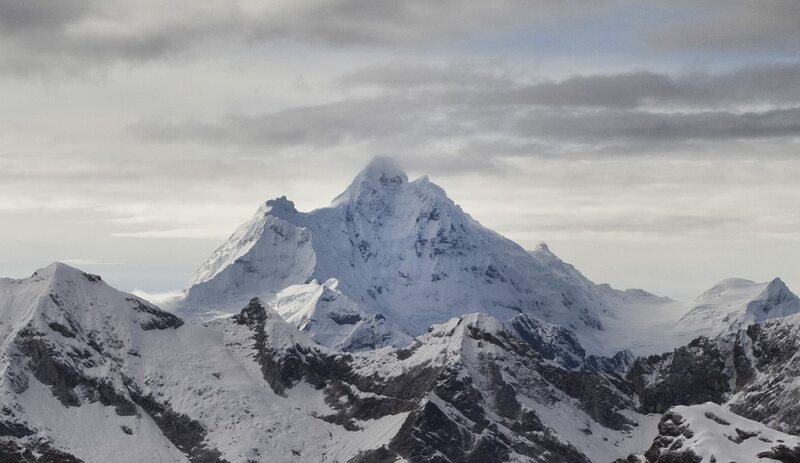 Huandoy’s tallest peak reaches 20,981 feet (6,395 m), making it the second highest mountain in the Cordillera Blanca (well, Huantsan, below, might have something to say about that: the two are often listed at exactly the same height). Huantsan is one of the hardest climbs in Peru, its arrowhead peak piercing the sky to a height of 20,981 feet (6,395 m) above sea level. Getting to the base of Huantsan is fairly easy, as it’s not too far east of Huaraz. But climbing Huantsan is a whole different prospect. Only experienced mountaineers need apply. Ausangate is the highest mountain in the Cusco Region of Peru, and the second highest in southern Peru. 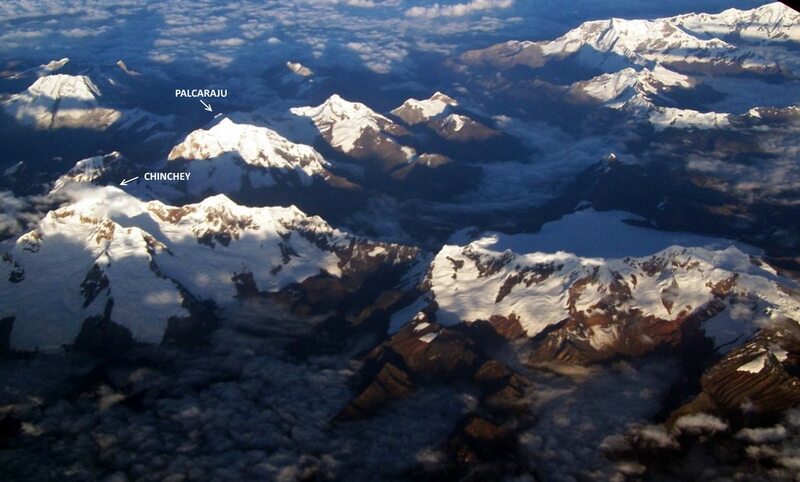 Its peak rises to 20,945 feet (6,384 m) in the Cordillera Vilcanota range, about 60 miles from the city of Cusco. The Incas revered Ausangate as one of the most important apus in Inca mythology. The mountain is still venerated, and is central to the annual Señor de Qoyllur Ritti festival. Ausangate is popular among trekkers and climbers, most of whom arrive in Cusco before heading to the small villages of Tinqui and Chilca. The town of Pacchanta is the most popular basecamp for trekking around Ausangate, and for ascents of its southern side. Chopicalqui is one of the easier climbs, relatively speaking, in the Cordillera Blanca, despite reaching up to 20,817 feet (6345 m). Easier, at least, than the likes of Huascarán, Huandoy and Huantsan. Summit Post calls Chopicalqui the easiest 6,000 m peak in the range. This makes it a popular climb and a comparatively crowded ascent. The town of Yungay, north of Huaraz, is close to the Chopicalqui base camp. 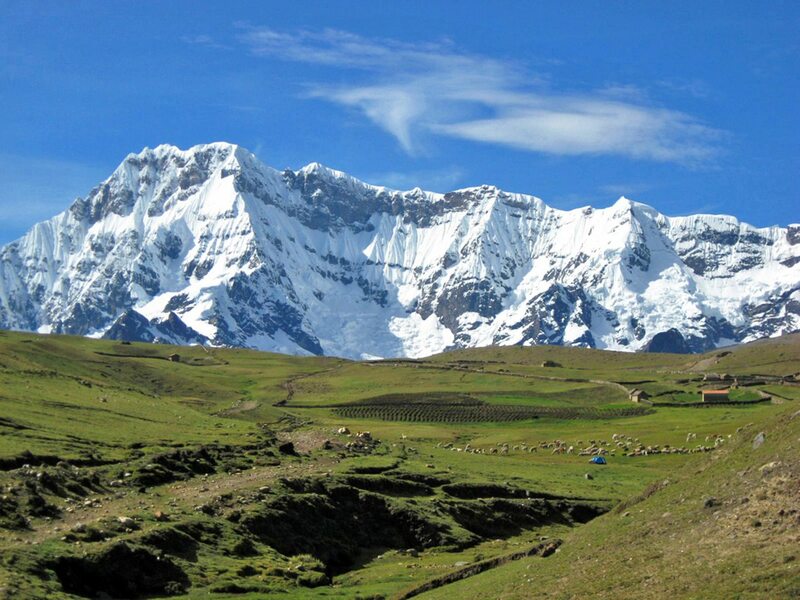 Siula Grande is the second highest mountain in the Cordillera Huayhuash after Yerupajá. 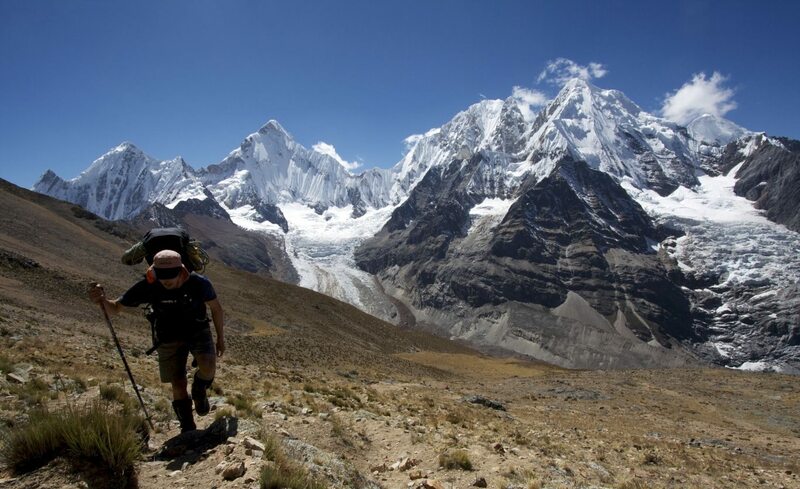 It was made famous by Joe Simpson, who wrote about his near-fatal climb of Siula Grande in Touching the Void, which was later turned into a movie. In 1985, Simpson and Simon Yates climbed the west face, becoming the first climbers to reach the 20,813 foot (6,344 m) summit by that route. The descent, however, almost cost Simpson his life. He fell and broke his leg coming down, and then he and Yates were separated in a storm. Read the book or watch the film for more of what happened — it’s quite a story. Nevado Chinchey is the highest peak in the Chinchey massif of the Cordillera Blanca. Chinchey rises to 20,698 feet (6,309 m), which is about 100 feet taller than Nevado Palcaraju (see below), which is about 5 kilometers away. Ampato is about 60 miles northwest of Arequipa. 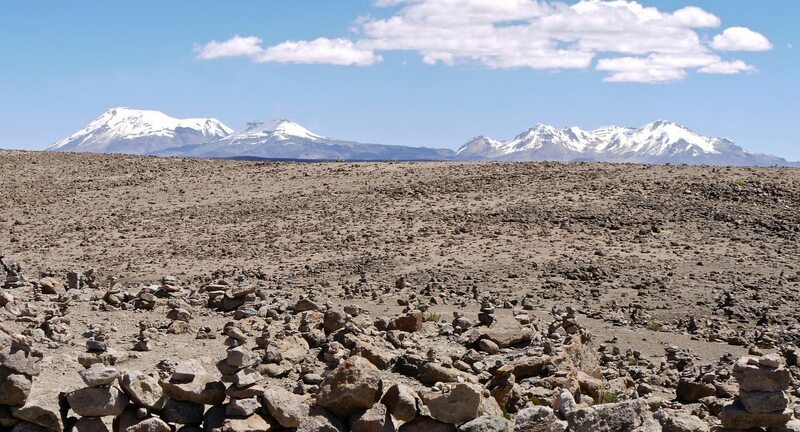 It’s a dormant stratovolcano, rising to a height of 20,630 feet (6,288 m), and forms part of the Cordillera Ampato alongside Coropuna (above at number 3) and the active Sabancaya stratovolcano. Ampato is famous for the discovery of the “Ice Maiden” Juanita near its summit. An expedition led by Dr. Johan Reinhard discovered the mummified and frozen remains of the Inca child in 1995. Investigations revealed she had been killed by a blow to the head, likely as part of a child sacrifice. Her eerily well-preserved remains, along with other mummies and artifacts discovered on Ampato, are housed in the Museo Santuarios Andinos in Arequipa. Palcaraju is a close neighbor of Chinchey, above. Its summit is about 20,598 feet (MTERS) above sea level. See Chinchey above for photo. Salkantay is best known as the name of an alternative trek to Machu Picchu, one which most Inca Trail tour operators now offer. The Salkantay trek is named after Salkantay Mountain, which rises up 20,574 feet (6,271 m) in the Cordillera Vilcabamba. It’s directly south of Machu Picchu Mountain (which, incidentally, is 10,000 feet / 3,048 meters high), and not far from Cusco. 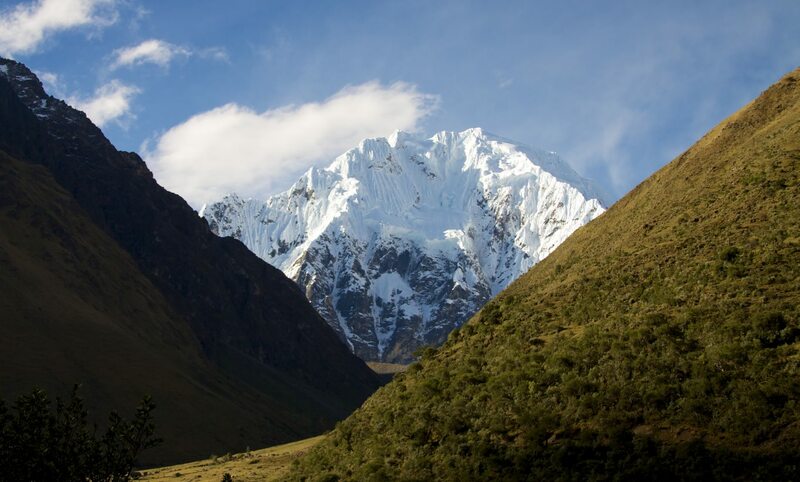 Like Ausangate, it was one of the most sacred mountains in Inca territory, and was believed to have the power to control both the weather and fertility in the region. Salkantay attracts plenty of trekkers of all abilities, although weather conditions and high altitudes can make the trek tough going. 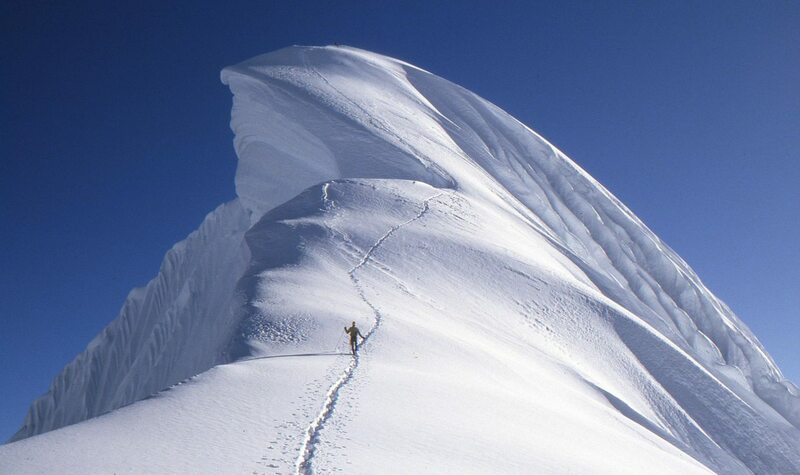 Climbers need to be more experienced if they want to reach the summit. They normally approach from the town of Mollepata, located about two and a half hours from Cusco. Great photos and text! Love it. I am from Stockholm, Sweden, also live in Lima. Just returned myt hometown Stockholm after four wonderful summer months in Peru. Wow, such lovely pictures you have posted. I really appreciate your post. Peru is a photographer’s heaven. As a nature lover, I have a plan for a trip and booked Llanganuco Mountain Lodge for staying. This week I will go to Peru and hope my trip will be successful.